Proof: the Science of Booze caught my eye when I was looking for something new to read in the science section--specifically in the topic of chemistry. 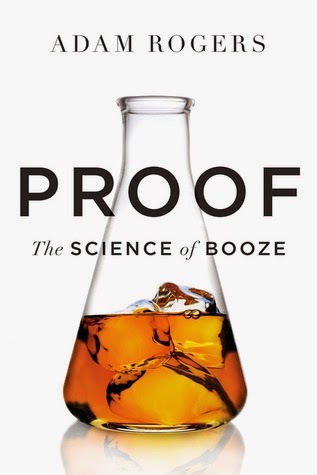 Adam Rogers presents a book that is a comprehensive look at the science behind alcohol and the mystery of why it has the effect that it does...all leading the reader to the grand conclusion of: "we still don't know." Serious examination and studies all lead to the same result of "we know what it does but we don't know why." It's less of scientific explanation as to the "why" of alcohol, and more of a scientific explanation as to the "how." There is a "why" present, but it is the closer examination as to alcohol's effect on the development of human society. “William Faulkner is supposed to have said, "Civilization begins with distillation," but I'd push even further -- beyond just distilled spirits to wine, beer, mead, sake ... all of it. Booze is civilization in a glass”(Adam Rogers). This is not a book about why people should or should not drink, nor is it a lecture. This book is a history of the human story...as seen from a glass of fermented grain, which makes it an interesting combination of a history book and a science book. I would absolutely recommend this book to anyone with an interest in chemistry or history, as it shows the development of a product that seems to always come back to the central consciousness of civilization. Want to see what else Adam Rogers has to say about the science and history behind humanity's love of fermentation? Proof: the Science of Booze is available at the Ocean City Free Public Library.